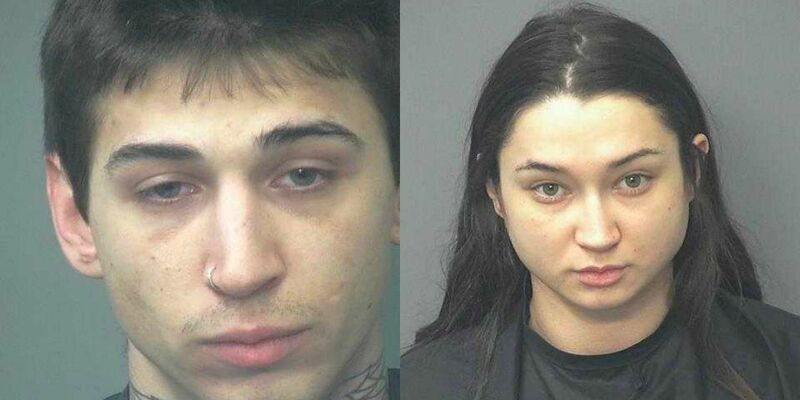 SIERRA VISTA, AZ (Tucson News Now) - 25-year-old Anthony Contreras-McKenzie and 22-year-old Alexandra Macy were taken into custody on drug and weapons charges on Saturday morning at the Los Arcos Mobile Home Park in Sierra Vista after police responded to a report of a single gunshot late Friday night. The Sierra Vista Police Department responded to the Los Arcos Mobile Home Park at 650 East Busby Drive at 11:02 p.m. on Friday, Dec. 7, and made contact with several witnesses who stated the gunshot originated from the area of trailer 113. Officers obtained information indicating several subjects had been arguing outside of their trailer just prior to the gunshot and that the resident of that trailer has a history of yelling outside their home and discharging a firearm. Officers attempted to make contact with the resident of trailer 113 but were unsuccessful. While at the trailer, officers smelled an overwhelming odor of fresh marijuana coming from inside the trailer. At 3:15 a.m. on Saturday, the SVPD Tactical Unit served a search warrant at trailer 113. Officers then took Anthony Contreras-McKenzie and Alexandra Macy into custody without incident. Officers obtained items relevant to the investigation as evidence during the search. An additional search warrant was served on trailer 35 at 6:15 a.m. and additional items relevant to the investigation were secured as evidence. Contreras-McKenzie and Macy was booked into the Cochise County Jail on the following charges: possession of marijuana, possession of marijuana for sale, production of marijuana, possession of a narcotic drug, possession of a narcotic drug for sale, manufacture of a narcotic drug, possession of a dangerous drug, and possession of drug paraphernalia. Contreras-McKenzie is also charged with misconduct involving weapons/prohibited possessor, and misconduct involving weapons/possession of a deadly weapon during the commission of any felony offense, while Macy was additionally charged with tampering with physical evidence, and fortification of a drug house. Both individuals remain in custody with Contreras-McKenzie having a $150,000 bond and Macy having a $100,000 bond. Anyone with additional information to this case is asked to contact SVPD Detective Branden Eaton at (520) 452-7500.